Since this is 3 weeks overdue (the HD transmission of the Met Berlioz’s Les Troyens occurred January 5th, while we were in Boston), and the production was some ten years old and if not senseless quite, disappointing, I’ll keep to what was good and puzzling feebleness. For me the opera came alive in the third act. The man who sang the lyric song opening it mourning about the coming journey and loss was poignant (either Iopas, poet at Dido’s court or Pathus, Aeneas’s friend or maybe it was Hylas a Trojan sailor so Eric Cutler, Richard Bernstein or Paul Appleby — the subtitles left something to be dseired). I can find no cast lists at Metopera.org; they are not made easy to find; I am shown where I can request a cast sheet, but that would take time. We didn’t get a cast sheet tonight as we were watching the night re-run. Then came Bryan Hymel who sang beautifully and trembled with emotion as he acted the coerced Aeneas. I can’t find a still of him alone which does justice to him: we do see Voigt to the side, and next to her the woman who sang Ascanius (very well, a mezzo). Susan Graham also came into her own. She finally commanded the stage which had been mostly silly — boxes and pieces of wood were everywhere throughout the opera and the backdrop illuminated bunches of wheat-looking objects. The last act was relatively bare and dark for a good deal of the time. I thought of Catherine Clement’s Opera, or the Undoing of Women, and when I came home today read the section of heroines who die on pyres. Such heroines sing out their resistance to losing. They lash out against all Rome stands for (think of Shakespeare’s Coriolanus, of the cold ambitious Augustus in Antony and Cleopatra). They refuse to be disdained. The betrayal of all that makes life worthwhile is before us, burning burning burning. Or going up in suggestive smoke — as in this feeble production by Francesca Zambello who utterly failed to articulate why she did what she did more in her interview during the intermission. What was wanted was some sense of how she viewed the 19th century transformation of Virgil. This final scene almost made up for the intermittent failure and absurdity of the other 2/3rds of the opera. Until then there had little inward drama compelling the scenes. I’m not sure why it is that the opening act with a fine Cassandra (Deborah Voigt) failing to warn her lover, Coroebus (a fine distinctive voice — Dwayne Croft? ), that Troy is about to be destroyed; and after it is so destroyed (off-stage with people running backwards and forwards on bridges on stage, round and round), Cassandra persuading the women of Troy to commit suicide — was so flat, a matter of going through the familiar motions. It just lacked any projection of passion. The New York Times agrees but doesn’t try to figure out why. 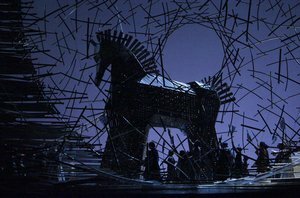 The fantastic horse was effective visually, but a paper-mache mechanical is limited in its emotional effects even when lit up by purple light and surrounded by spears in interesting geometric patterns. The second act turns the stage into this decorative Arcadia (complete with streamers as in a party) which is supposed to stand for paradise. Eventually glass greenhouse with plants in it surrounds the characters. 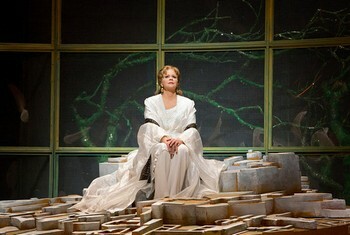 Dido is all benignity and strength among her family members and court; Aeneas arrives, the familiar love story ensues. 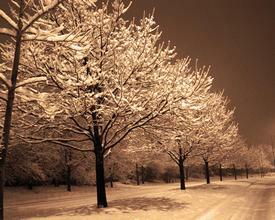 The whole of the history of journeys, the past, identities is reduced to a love story. The greenhouse is taken away and we have a make-shift throne where Dido and Aeneas with courtiers and relatives near by sit down (for all the world as if they had taken refuge in the Nutcracker) to watch at least 45 minutes of dance and ballet. It being well after 10:30 pm I fell asleep. Probably the dancing was good, it just went on for too long. In the 19th century productions the two dances would have occurred at separate points in the opera. I woke up to listen to the soaring love exchanges between Hymel and Graham as Dido and Aeneas, he abandoned, she melting. But duty — as we all know — intervenes. 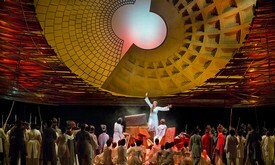 And the next act opens up with huge sails all over the stage (against which the two male arias described above are sung). These are pulled off like so much curtains to reveal a great circle on the wall and the pyre — covered with the usual boxes and pieces of wood. The opera needs to be re-produced, re-thought completely. I don’t know what one is to do with all the vast choral numbers which do seem to go on and on. This is an opera where the composer has been overtaken by the presence of the super-ego who as chorus appear in piles of bodies, or crowding the stage, or in rows, often in ridiculous costumes with funny hats. Maybe ruthlessly cut them down. I rather liked the use of whitish ghostly cosmetics and costumes for Coroebus, Priam, Hector and Cassandra in the last act probably because each was carrying a wide bowl of fire which cast an odd gleaming light on them, but in the earlier part of the opera where the outfits were left in ordinary bright light, they seemed something left over from the outside of a vaccuum cleaner. I do tire sometimes of the inane interviews. Joyce DiDonato is becoming an more animated interviewer but she spoke at the level of “how exciting it all is.” Some time or other I should count how many times the word “exciting” is uttered to substitute for content. And the hype. 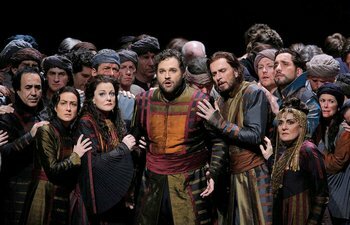 No one can do an opera “like this” “but the Met, only the Met” has the resources. Fabio Luisi injected a little content when he said the opera was formal and Berlioz imitating Gluck but as he didn’t explain himself that did not get us very far. And the idiotic pop psychology as explanations for how they are doing the characters grate as substitutes. When the interviewer and singers do come to talk of the singing, then conversation can become realer. Or when they speak generally of a a change in production where when the decor is modernized or turned into “Euro-trash” (half-satiric) the general slant of the character changes. Maybe the Met has the worst talk in interviews of all the HD opera companies we now see. It has been a genuinely cold day and as before when we came to the opera re-run, the theater was nearly empty. HD opera is not popular when it’s not also live at the same time. Maybe 15 people at most. During the first intermission we talked with a Swedish couple near our age. They seem just to have started coming to the HD operas and wondered how we had found out about it originally. “The Net” I said. “Ah!”, they were not much on it. When we said the opera (up to that point was oddly passionless), they said we should go to Eastern European operas. Just deplorable. As the second intermission began (audiences are friendly in these HD movie-house presentations), I heard someone say it had become very frigid outside and started to snow lightly. I’d say over half the audience left after the second act, so for the third act there were at most 6 people (including Jim and I) in the audience. They thus missed the best part of the opera, what was worth the seeing and hearing. In our area the Metro does cease around 11:30 pm. We had our Jaguar which does not do well in snow, but we stayed because Jim does so love opera and we were rewarded with that final powerful act after all. Coming out at midnight, all was quiet. I tripped along as lightly as I could in my ballet slippers in the snow showered parking lot. We drove super-slow home, round-about where we could avoiding hills (stayed on flat blocks). It’s good to feel and see some winter (as long as you are not homeless) and the pussycats were glad to see us when we got in. They were entwined with one another not far from the grates where the heat comes out in our house.